She is a fan of Team Righteous and has always liked watching them "on the news films," and is a little ditzy. She was very glad "they" had came to help them against the yearly threat, a flock of Taillow. And it seemed that she was particularly worried about James, while he has a crush on her. 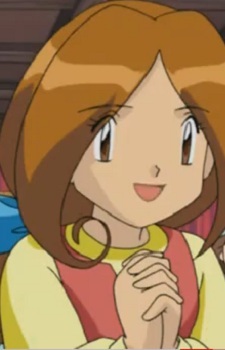 James tries to convince Jessie and Meowth to stay in the village and help them in case of trouble, but they eventually got blasted off and returned to trying to steal Pikachu.